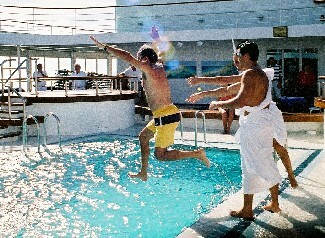 Crossing the equator is a rite of passage for cruisers who haven't crossed the legendary line before. To make it all more memorable, a ceremony is performed to mark the occasion. I had the chance to partake in this "event" during my recent Silversea Silver Shadow voyage from Barbados to Rio de Janeiro. What I discovered is that this tradition is downright messy. Long Time At Sea Sailor? 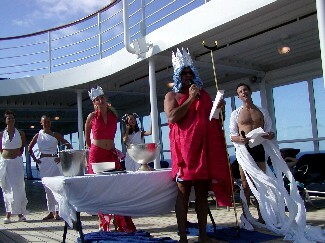 To combat boredom on otherwise monotonous days at sea, sailors concocted the ceremony as a sort of comic relief. According to numerous Navy sailors in my family, the ceremony was often a severe hazing. Yet, it still is carried out today on Navy ships, merchant marine vessels, and cruise liners-where things are much tamer. Ceremonial practices vary from ship to ship, yet there's a common theme. The first-timers, typically called polliwogs, are subjected to good-natured banter by those who have crossed before, known as shellbacks. The ritual is a complex saga involving a motley crew cast of characters including the Royal Court of King Neptune, Queen Amphitrite, and a host of royal groupies, including the Baby, the Barber, a Scribe, and Prosecutor. When the ship nears the equator, a shellback playing King Neptune appears bearing a stack of subpoenas for the polliwogs. 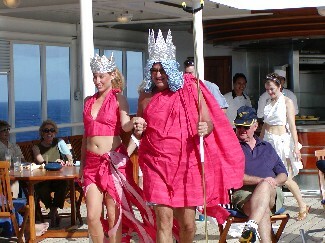 He graciously greets the Captain and orders the polliwogs to appear before him and his royal court. The royal Prosecutor charges them with a variety of fabricated offenses detailing their unwelcome intrusion into King Neptune's domain. The charges are a list of silly complaints amassed by crabby shellbacks. The polliwogs are then blindfolded, "spruced-up" with a gooey, foamy mess by the Barber and forced to kiss the Baby's belly. 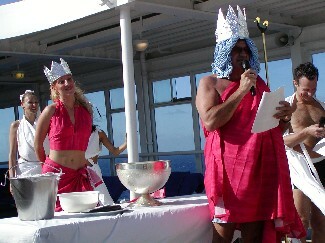 Polliwogs are then given a symbolic baptism-a dunking in the pool. The dunking solidifies their transformation from polliwog to shellback. Afterwards, the new shellbacks are presented with official certificates by the captain to confirm their crossing. You might think the well-to-do are too serious to partake in such nonsense. As I watched former executives and socialites abandon their normally restrained disposition; first impressions could not have been more wrong. A good time was definitely had by all. 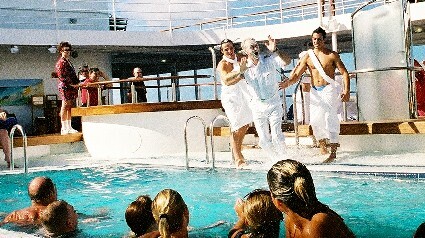 On Silver Shadow: Dignified Elegance - What it's really like to cruise the world's best rated cruise line.